Is life a game? Arguably not, but since games often resemble everyday life in many different ways, plenty of life lessons can be deducted from them. A simple and fun puzzle game called Flow Free can teach you a thing or two about problem solving, cooperation, and strategy. Flow Free is available as an HTML5 web app, as well as on Android, iOS, Windows Phone 8, and for Windows 8.1. 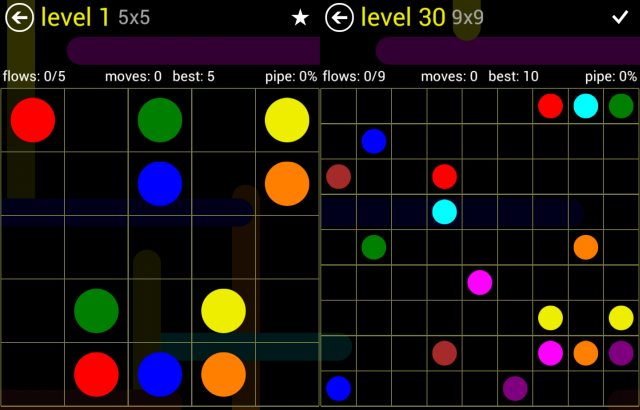 Flow Free is also one of our best Android and iPhone games. Briefly, your challenge is to connect all the dots on the grid, without leaving any spot empty. You can only connect dots of the same color to create a flow between them. 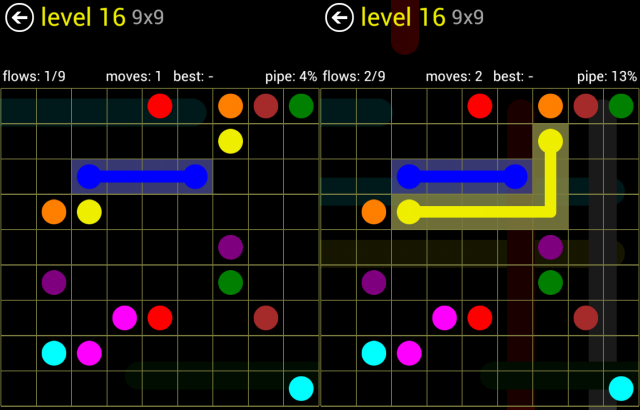 The total number of flows equals the minimum amount of moves necessary to complete the level in a perfect manner. As the game passes through levels, the grid becomes larger, and you are faced with more and more dots, making it increasingly difficult to solve the puzzles. 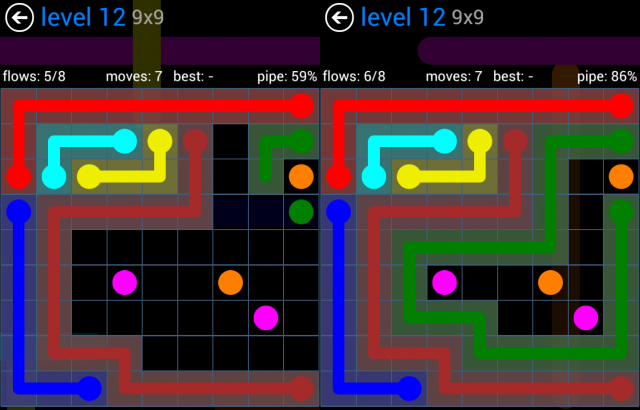 In an advanced version of Flow Free, bridges allow the dot-connecting pipes to cross each other. You are never too old to start or learn something new. This brings us through to the next point. You don’t need anyone’s permission to play a game. The same is true in life. Sometimes, you just have to follow your impulse. Flow Free starts with an easy 5×5 grid and 5 flows, i.e. 5 pairs of dots you need to connect. Compare that to the complex 9×9 grid with 9 flows. In a game, you’d never ever think of starting with the most difficult level, that would not be fun. The whole design encourages you to start from level 1 and often makes it impossible to jump ahead. Yet in life, we try to get ahead of ourselves all the time, which can be very frustrating. Game designers understand it’s necessary to keep the player engaged, meaning they must maintain the delicate balance between challenge and frustration. Start from the beginning, study basic principles, learn as you go, and build your skills gradually. Flow Free can teach you a little about strategy and problem solving. Once you get started, you’ll want to begin with an obvious connection. This will make subsequent steps much clearer. Start with the low-hanging fruit! The best games don’t require much explanation. In life, we often have the opportunity to receive detailed instructions and advice from others. And when you’re starting at a level way above your skills, that might be necessary, or at least will speed things up. Games, on the other hand, teach us to experiment and learn from mistakes. Trial and error can help you develop your skills and see clearer. What often holds us back in real life, doesn’t seem to be a problem when playing games: the fear of failure. In games, making mistakes is OK. You can start over, try again, and failing might actually help you understand the game a little better. Let’s take the Flow Free situation depicted below. I had actually connected all the dots, but I had 18% of pipe left, meaning the puzzle was incomplete (left). This taught me that I must use the entire space while connecting dots. 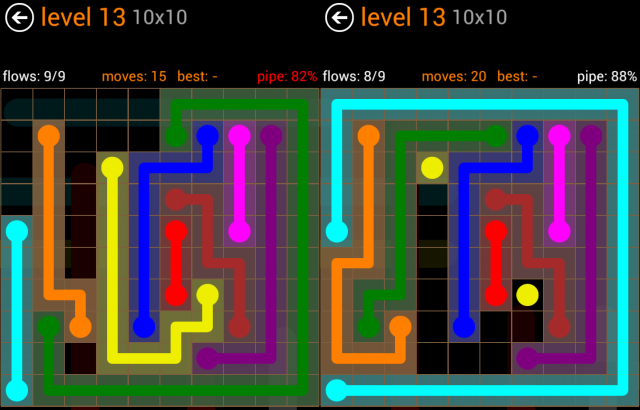 So I re-arranged several of the flows to solve the puzzle (right). In games, you can easily make mistakes and fix them. In life, mistakes are not always easy to fix, but you can’t entirely avoid them either. Embrace mistakes because they can teach you valuable lessons. One of the key lessons of Flow Free is that the shortest path isn’t always the one that leads to success. When you are taking a shortcut, you are missing the point! That’s because all of the dots must be connected and all of the space must be used. To respect these rules and complete the puzzle, you must often take a detour. That’s what makes the game challenging and fun, and the same is true for life. To finish the game successfully, you have to take all positions into account. Let’s look at the example below. You could easily take a shortcut to connect the green dots and get it over with (left). But then the orange dots would be blocked from connecting. To keep their path open and complete the game, the green pipe has to be dragged around the orange and pink dots in a huge detour (right). Find out what your team and each individual member need to succeed, then help everyone understand what compromises are necessary, for the entire team to succeed. Once everything is in sync, success will come easily. Of course, communication is the hardest part. Can you show me a simple game that will teach those skills? And what are the lessons gaming taught you?